The upcoming Samsung Galaxy S10 smartphone might come with a second display area to accommodate the under-display front camera. We already know that the company is going to launch the Samsung Galaxy S10 lineup of smartphones on February 20 and the latest news (which has come up courtesy of Letsgodigital) suggests something which was not heard of so far. A recently published patent suggests that Samsung may want to create a second display area to prevent the display hole, which is necessary for the implementation of the front camera, to be left unused. Various creative possibilities are described. On January 16, 2019, a new patent was published from Samsung Electronics in the WIPO (World Intellectual Property Office) database for an ‘Electronic device having display’. The patent was filed in March 2017 and describes a smartphone with a full front display different holes for the front camera and optical sensors. The patented Samsung smartphone has two displays. A full-screen (AM) OLED display and a small transparent display that houses the in-display sensors and the front camera. 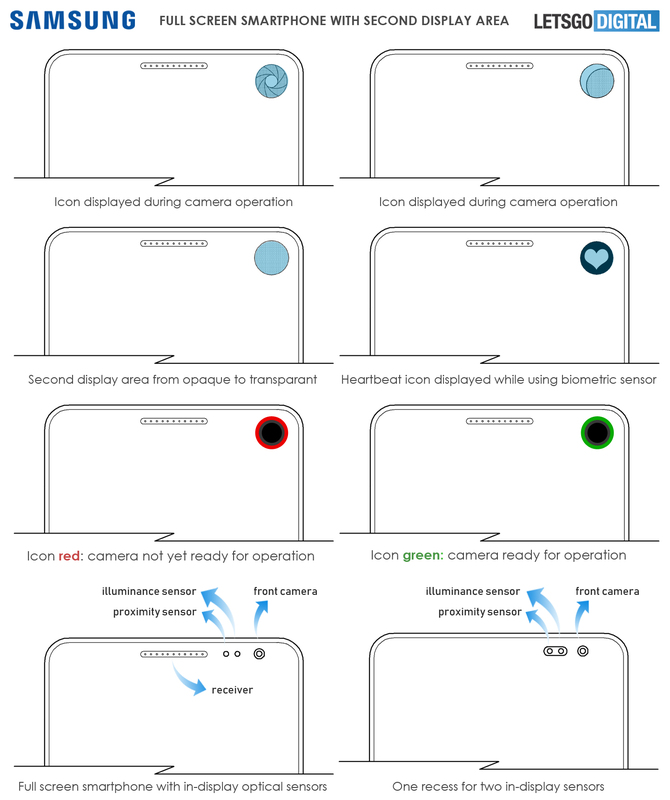 Only there where the receiver is placed is no display, but it is placed in the glass and not in the bezel, as is the case with the newly introduced Galaxy A8s and the Huawei Nova 4. Behind the transparent screen, various optical components are processed, which work with the help of light. Think of a proximity sensor, lighting sensor and of course the front camera. In addition, an in-display fingerprint scanner is installed. Furthermore, the full-screen smartphone is equipped with a metal frame in which the antenna radiators are processed. The second screen area has a lower resolution than the main screen. Individual recesses can be made for the sensors, but it is also possible that one recess for two sensors is made. The two display areas can be activated independently of each other. Icons can be displayed on the transparent screen area, depending on the application used. For example, a heart rate icon can be shown when using a biometric sensor (such as the built-in fingerprint scanner). A camera lens can also be shown when starting the camera application. These icons are also displayed in an animated way. In addition, the degree of transparency can vary, depending on the displayed content. The transparent display is also capable of showing color. This way, the small display edge around the camera hole can change color and thus serve as a charging indicator. During the startup of the camera application, for example, it is colored red and as soon as the camera is ready for use it turns green. It can also blink, useful when taking a photo via the self-timer function of the device. The A8s is also equipped with a similar hole animation. This front camera is also touchable, although it does not contain a display area. With the Galaxy A8s, the ring around the camera can light up white. You can not buy this Galaxy smartphone in the Netherlands, the mobile device is only available in China. Incidentally, two smartphone models are shown in the illustrations supplied, one with a flat display and one with rounded corners. With the edge variant, the placement and the number of sensors differ from the flat screen. It is expected that the Samsung Galaxy S10 Lite (S10E) is equipped with a flat screen, while the other S10 model variants get an edge display. Next, the Samsung patent describes a method for correcting the image displayed on the second screen. For this, use is made of a ‘light path conversion device’, which is integrated as an additional display layer, in the form of a grid pattern. The light emitted around the camera hole from the main display can be condensed on the second screen. The smartphone can detect whether an application is being used that is related to the camera or the biometric sensor. If this is not the case, the second screen will be filled with a corrected image, based on what is shown on the main display. If so, the second display is filled with the previously mentioned icons. Finally, the documentation states that the patented technology is not only applicable to a circular hole. Similar technology can also be used with other forms, such as an oval hole. The Samsung Galaxy S10 Plus is supposedly equipped with an oval hole to accommodate the two selfie cameras.